Net neutrality: German Chancellor Angela Merkel supported fast lanes at the Digitising Europe conference in Berlin. 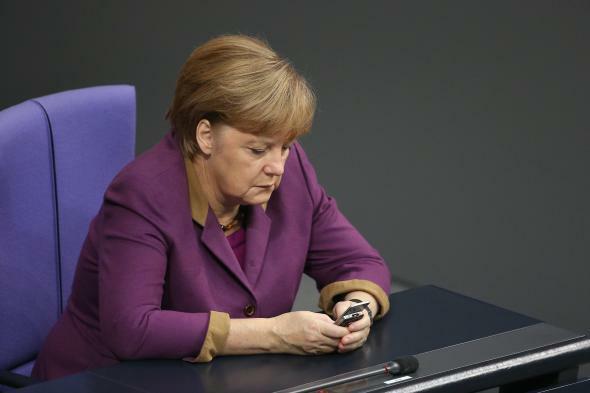 Life in the fast lane: Angela Merkel checks her cellphone in 2012. At the Digitising Europe conference in Berlin on Thursday, German Chancellor Angela Merkel made her stance on net neutrality abundantly clear. She said that she advocates for a system where Internet is provided in two categories, “one for free internet, and the other for special services.” Sounds a lot like a fast lane, doesn’t it? The Local reports that Merkel wants the two categories to run on Germany’s existing Internet infrastructure. The faster connection would provide “guaranteed reliability for special services.” Merkel says she is thinking about reliability for services that we can all agree would need rock-solid connectivity, like driverless cars or medical networks. But the proposal is at odds with net neutrality tenets and could keep small companies from rising within those spaces and in general. Germany is known for having strict data privacy laws, and the European Union currently has strong policies to preserve net neutrality. But conversations about the best way to evolve Internet policy could be affected by Merkel and others who don’t see net neutrality as aiding innovation. Net neutrality advocates in Germany told the Local that Merkel’s party, the conservative Christian Democratic Union, is known for having close ties to telecom lobbyists.